Baccarat is one of the oldest and most popular casino card games, a distinct favorite among high-rollers. The game is as easy as betting on the flip of a coin. It involves a banker or dealer, and two players also known as ‘punters.’ The game is similar to blackjack where players bet against the house. The croupier or dealer deals each player a maximum of fifteen cards. The objective is to receive a hand from the dealer a number as close to or equal to nine. To win the jackpot, a player needs to beat the dealer’s hand. Face cards and tens are valued at zero while the value of all the other cards correlates with their numbers. One hand is the player’s hand and the other the dealer or banker’s hand. Players make all bets before the cards are dealt. There are only three types of bets to choose from. You can bet on the player’s hand; banker’s hand; or a tie. A winning bet on the player’s hand pays even money. A win on the banker’s hand is similar. However, there is a 5 percent commission charged on winning bets. Winning bets on a tie usually pay 8 to 1 although this is usually not a favorable bet since the house edge is 14 percent. In Baccarat, both hands begin with two cards. 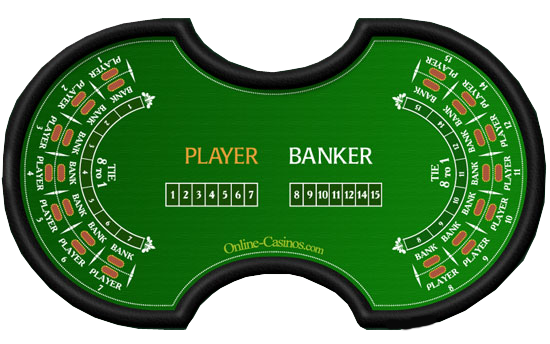 The banker or player may draw one more card depending on the starting total. The hand that comes closest to 9 wins. A hand totaling 10 or more subtracts ten points so a total of 10 is worth 0, 11 is worth 1, and so on. There are three types of baccarat tables. In Big Table baccarat there are 3 dealers with up to 12 or 14 players. Each player has the option to bet on the player or the banker but the dealer must bet on the banker. The rules are similar In Mini Baccarat which also features similar odds. The cards are dealt from a six-deck shoe. Midi Baccarat is usually found in high-limit rooms and is similar to mini baccarat expect that the table is larger. Baccarat is among the most prestigious table games in the casino. It’s a shining example of a game that gives you a fair chance against the house, but doesn’t require skill or advanced strategies in the same time. If you’re not skilled at Craps or Blackjack, then perhaps Baccarat is just the game for you. It’s a simple and slow paced game that enables you to have fun in a nice and cozy friendly environment and win some money in the process. The rules of the game are rather simple and the only thing you, as a bettor, need to think about is what you want to bet on and how much. This is the only decision you have to make in the end of the day. You don’t even need to know the rest of the rules and you can still win. Baccarat is usually one of the most elite games in the casino. You will see that staff dressed in impeccable tuxes and dresses, and most of the players wear fashionable evening attire, as well. The game is slow and enables you to relax while you play it. The enchanting atmosphere will help you forget about everything outside the game in the given moment. It’s basically a sophisticated game of coin toss. The rules are really simple – you sit on the table and decide what hand you want to bet on. There are three options (two, if you’re smart) – betting on the Player’s hand to win, betting on the Bank’s hand to win or a tie (the third option gives the house a huge edge so it’s generally not advisable to make that bet). It’s important to say that the Player does not correspond with you, nor does the Bank correspond with the house. You are betting on the outcome of the hands. You can bet on whatever you want. The Player and the Bank are like the two sides of the coin, and you are betting on Heads or Tails. Since Baccarat is a bit of an elite game, the minimum bets on a table are usually among the highest in the casino ($25 is standard in most casinos ,but it may vary from casino to casino). Aside from the enchanting atmosphere around the Baccarat table, the table itself looks interesting and might even intimidate a new player. It’s a lot bigger than your standard issue Blackjack table. It can be comfortably compared to a Craps table. It can usually hold up to 16 players sitting down but sometimes standing players are allowed as well. There are betting boxes in front of the seated players corresponding to their seats but if you’re not sure where to place your bet, you can ask the Dealer. If you are a standing player, then you will have no choice but to ask the Dealer where to place your bets. Worry not, though. The personnel at the casino is usually polite and friendly, and since many of the high rollers tend to play Baccarat, you will see that the staff manning the Baccarat table is even friendlier. You can always ask questions if something is unclear and they will be happy to help. The table is divided into 2 mirror parts with up to 8 seats on each side. No matter where you sit, you have three choices – bet on the Player, the Bank or a tie. Sometimes, though, spontaneous competitions arise and one side of the table starts to bet on the Player and the other side of the table starts to bet on the Bank. These aren’t real competitions – it’s just something players sometimes spontaneously do. Casinos love those occurrences, because no matter which wins, the house is also victorious. The personnel are situated in the middle. There are small indentations in the middle of the table, and this is where the staff sit or stand (depending on the casino). At least three people are needed to make the table work – at least two Dealers and a supervisor. Whatever the case, you can rest assured that if you play Baccarat, you will receive the best service in the house. The game of Baccarat usually appeals to mostly the high rollers. This doesn’t mean that it’s reserved only for the affluent, though. Anyone can enter if they can afford the minimum bet for the table. Whatever, you will definitely be impressed. The game is played with a different number of decks, most often six or eight. The cards are placed in what’s called a “shoe” and that’s where they’re dealt from. After the hand, they are placed in a discard container, usually under the table. Some casinos have employed automatic shufflers and always have the next set of decks ready to be placed inside the shoe in the interest of saving time. The good casinos, however, like to put a little show up for their customers. The way the cards are shuffled and mixed can take up to ten minutes and is a really interesting ritual. After finishing the game, the cards are taken from the discard container and placed on the table. They are shuffled around by the dealer at everyone’s attention and sometimes amazement (it’s especially astounding for people who are used to playing the game in casinos with automatic shuffle). After mixing the cards well, the Dealer gathers them and gives them to a player to cut. After he gets the cards from the player, the Dealer flips the top card and whatever value it shows is the number of cards that will be discarded from the decks. Then the cards are placed into the shoe and the game begins once again. This is a very nice ritual because it gives you the chance to take a break. It gives you the sense of movement and creates space between games, which always good. If you want to play a game, just approach the table and sit. I usually prefer the far end of either side of the table because it gives you the best view, but you can sit wherever you like. You probably know the drill already, but I will still say it – when you get to the table, exchange your money for chips. Then you can bet all you like (until either you get sick of it or you run out of chips). The table minimum is usually $25 and since most Baccarat players are high-rollers, you will probably notice that most of the chips handed to you are $25 chips. Still, smaller denominations might be needed, but more about that later. Before you begin playing, just take a good look at the table, the staff, the players. Notice what’s happening. Breathe in the magic. You will see that there’s nothing intimidating about the game and in fact you’re probably a natural at it (since it mostly requires luck). The rules are simple and everybody is usually friendly. It’s a gambling experience like no other. Maintaining a Baccarat table is no easy job. It requires at least three people to man it and it takes up a lot of space, a lot more than it should according to some casino managers. That’s why, in interest of cutting the cost but still give you a taste of the Baccarat experience, some smaller casinos have Mini-Baccarat tables. This way the table requires only one Dealer and a supervisor (or a Pit Boss) and the table is much smaller – instead of Craps-table size, it’s closer to Blackjack-size table. 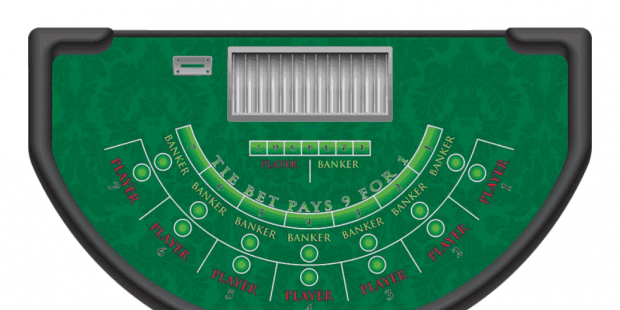 As for the game itself, it plays just like its bigger sibling – you give the Dealer your cash and get some chips, then bet on the Player, Bank or tie. However, the cards are dealt by the Dealer heads up, meaning you can see them as they are being dealt. You may not think this is a big deal, but trust me – it is. It kills a large part of the mystery, and hence the enjoyment and thrill of playing Baccarat. The payoffs are made by the Dealer after each round. In a sense, Mini-Baccarat is the crude version of the real game. However, a large portion of the mystery, magic and glamor are taken away, replaced with efficiency and cost-effective solutions implemented by the casino. It gives you the basics of the game, but it doesn’t really enable you to enjoy in the same you would when playing on the big table. It’s much faster and focused on effectiveness. This is not what Baccarat is supposed to be about. Think of it this way – if Baccarat is nice, juicy steak you eat a nice restaurant with a glass of exquisite wine, with classical music playing in the background, then Mini-Baccarat is eating a cheeseburger at a stuffed join, drinking a soft drink right out of bottle, trying to satisfy your hunger as soon as possible, with some pop music you can’t stand playing in the background. This is the difference for me. If you want to try the game, try the real thing. Baccarat, enchanting as the game is, carries within itself the simplicity and candor of the fairest of games. The Baccarat table is usually where the high-rollers reside.